The Moon’s far side with the Earth in the background. A unique view of the Moon, with its far side facing the camera and an unsettlingly tiny Earth lurking in the background, has been captured by China’s Longjiang-2 satellite. China’s Longjiang-2 satellite, along with the Queqiao communications probe, has been in lunar orbit since June 2018. Longjiang-1, a sister satellite to Longjiang-2, didn’t manage to leave Earth’s orbit after launch in late May, but that’s been the only dark spot on what has otherwise been a successful mission for the China National Space Administration (CNSA) and its effort to study the Moon’s far side. Back in early January, the Chang’e-4 lunar probe, which launched in December 2018, successfully landed on the Moon’s far side, deploying its tiny robot, snapping stunning panoramas, taking the temperature of the Moon’s ashen regolith, and even doing some pioneering lunar gardening. But none of this would be possible without Longjiang-2 and Queqiao, which are serving as critical relay satellites, allowing mission controllers to stay in contact with Chang’e-4 as it works on the Moon’s hidden side. Longjiang-2 is a microsatellite measuring just 20 inches across, and it’s equipped with a Saudi Arabian-built optical camera. The tiny satellite took beautiful pictures of the Moon after reaching lunar orbit in June 2018, but in early January 2019, as the CNSA was carefully monitoring the landing of Chang’e-4, it invoked a radio-quiet period to minimize interference, according to CAMRAS, which manages the Dwingeloo Radio telescope in the northeastern Netherlands. This rotatable 25-meter radio telescope—the oldest of its kind to still be in service—is helping the CNSA with its radio communications for the lunar mission. The CNSA lifted Longjiang-2's silent period in mid-January, allowing the satellite to take photographs once more. On February 3, the CNSA had the satellite capture a timelapse of the Moon with the Earth in the background, which was subsequently transmitted to the Dwingeloo telescope the following day, CAMRAS reported. 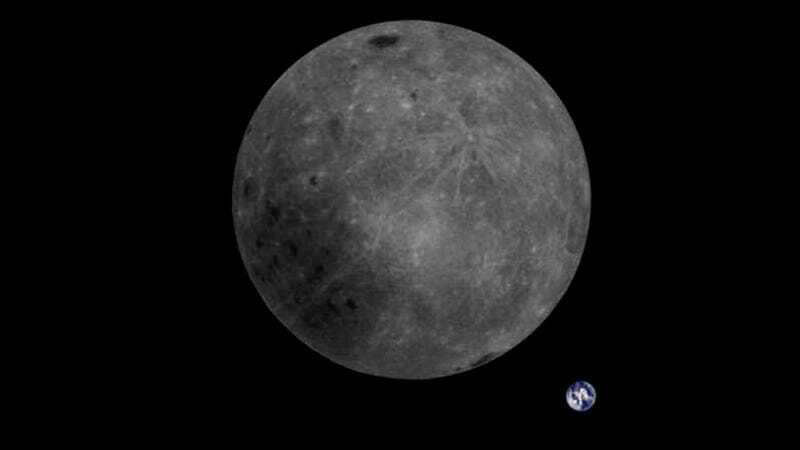 It’s the first photo captured by Longjiang-2 that shows the Moon’s entire far side and the Earth together in the same frame. CAMRAS is expecting to receive more lunar pics next week, so there’s more to come. Importantly, Longjiang-2 will be doing more than just take cool pics—it’s also slated to conduct low frequency radio astronomy and amateur radio experiments, thanks to its separation from our planet’s ionosphere.